I don't know about you but this winter has done a number of my skin and lips, in addition to my soul. Winter never ends here! While there is nothing I can do to about the soul crushing length of winter, I can do something about my dry lips. The only good thing about winter is the opportunity to rock a bold dark lip so keeping my lips smooth is critical. && the only thing worse than winter is Sephora charging $24 for a sugar lip scrub. Yes, $24 for a sugar lip scrub. Seriously, peep the ingredients. Sugar is the first listed ingredient. Well, you know I love a good wallet friendly alternative and I was up to the challenge opportunity to DIY something myself. Luckily, I already had sugar cubes in my pantry. So, get ready for this earth shattering DIY! A jewelry tray for good measure. You can use this tray when staging a humblebrag Instagram picture. 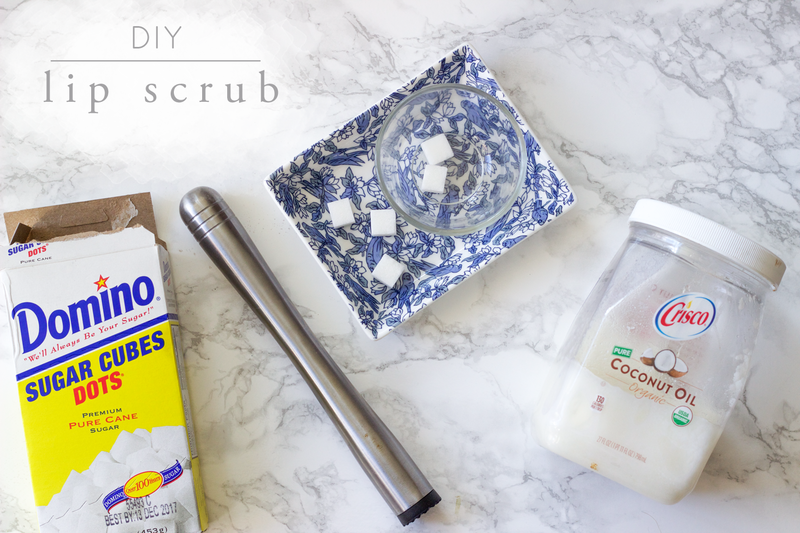 Muddle sugar cubes with coconut oil. Yep, that's it! After you've muddled the oil and sugar cubes, scrub the paste on your lips and rinse off after a few seconds. Your lips should be smooth and moisturized, and prime for a bold beautiful pout. So easy! Definitely trying this!